Form No. 4.-100 - 17.8.10. Delivery Date 15 APR 1912. No. 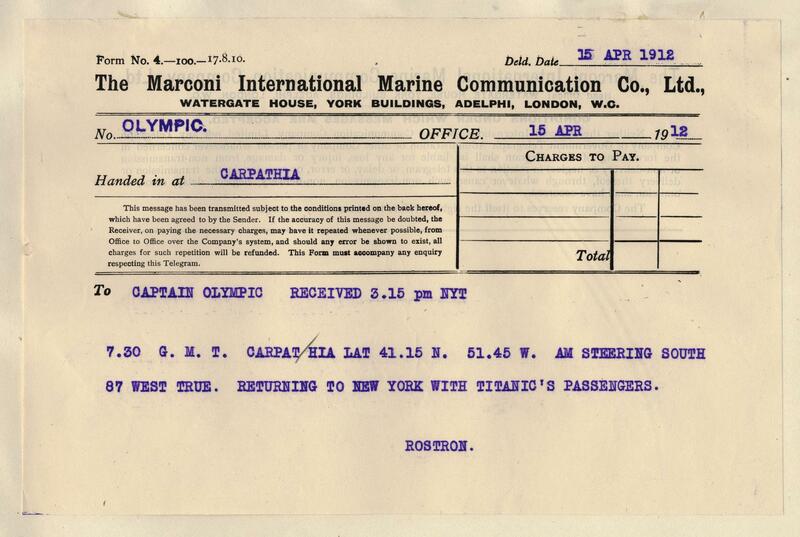 OLYMPIC, Handed in at CARPATHIA. To : CAPTAIN OLYMPIC RECEIVED 3.15 pm NYT. 7.30 G.M.T. CARPATHIA LAT 41.15 N. 51.45 W. AM STEERING SOUTH 87 WEST TRUE. RETURNING TO NEW YORK WITH TITANIC'S PASSENGERS. ROSTRON.